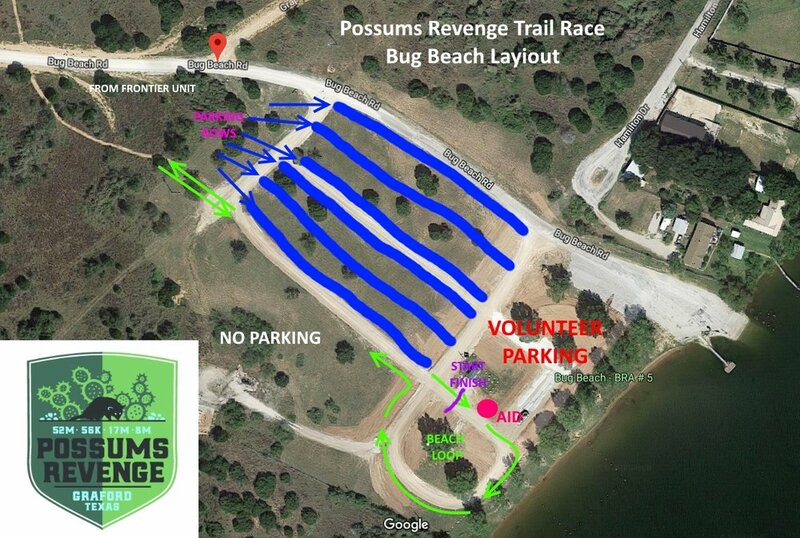 The Possums Revenge Trail Run is on the varied and great terrain on the Possum Kingdom Lake Hike and Bike Trail System located 90 miles west of the central Dallas/Ft Worth Metroplex. The trails have a variety of terrain that included mostly double track trail with some sections of singletrack. 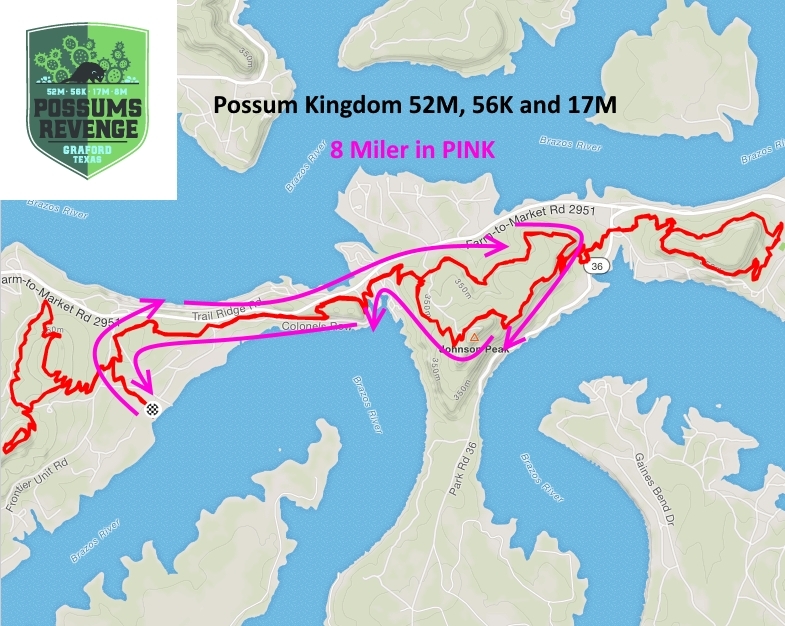 The course has some great climbs to see the amazing Possum Kingdom Lake mixed with rock, roots and great trails. All aid stations (X) are FULL AID STATIONS and will be full stocked with Texas Style goodies. The Frontier Unit Aid will ONLY have Water and Ice. Pacers can start at the beginning of loop 3 (mile 34.80). All pacers must sign race waiver located at the start/finish area at Bug Beach. You may have drop bags at the 3 manned aid stations. Main, South D&D and Lavilla. This depends largely on where you are coming from but here is the LINK to right at the start/finish area. See Possum Kingdom Lake Hike & Bike Trail Map for reference. Note: Campsites are first come, first serve. Note, I have yet to see more than a couple tents. Also, no water hook-ups or electricity at any of the campsites. Bug Beach (Use Area #5) – Approx. 12 campsites…loosely stated. Start/Finish area and has a bathroom (no showers). The above map should provide great insight of everything close to the race site but you can always check out the PK Chamber of Commerce Visitors tab for more. Top 3 Men/Women and Top 2 Masters (50+) in each race. All Runners will get a custom medal from Elevation Culture with their specific distance on the medal. New custom made buckles for 69 mile finishers!